On Friday February 1st, the team sat down and did a full robot design review. This is something we do most years. It’s a great way for the folks not heavily engaged in the design (who don’t pay attention to the posts in Robowrangler Slack) to “catch up” with the status of the robot. “This is all about systems integration. There isn’t a lot of clever design work or “new ideas” being determined. We’ve taken all the ideas we’ve had as a team, turned them into prototypes to prove them work, and have figured out the basics of “how we’re going to do everything.” That’s not what’s happening right now. Right now, design folks are “Figuring out where things fit”. It’s a lot of discussions like “So how many inches do we need next to each drivetrain pontoon to fit the climber?“. The review went very well. We made some important decisions as a team (unrelated to the robot). We also set the plan to move forward. We’re getting into crunch-time here! We’re bumping into a problem we haven’t faced in a long time. Our entire process is built around the fact that we get parts made FAST. Manufacturing so fast the parts are ready before the designers even sleep off their CAD binge. This year, we’re continuing the new design methods we experimented with on the 2018 robot and refined in the X019 prototype. Lots of 3D printed parts. Lots of thin sheet-metal structures reinforced in key places with 3D printing. LOTS of 3D printing… on EVERY subsystem. Oops. While our sheet-metal. lexan, and lathe-turned production remains just as fast… we’ve totally overwhelmed our 3D print capacity. Unfortunately we didn’t plan for this, and have created a manufacturing bottleneck. While it’s certainly something we can overcome (and in fact we’re already doing things to fix the problem). Don’t worry, we’ve already had the “Let them eat cake” / “first world problems” moment. We’re certainly self-aware enough to realize how ridiculous this problem seems. Good news, we got our first run of sheetmetal parts back from manufacturing! Bad news, we can’t really do much assembly until more 3D printed parts are done. It’s not the best Sheet Metal Christmas we’ve ever had. It’s kinda like that Christmas where Scrooge finds out Tiny Tim died, but they’re all still trying to find joy in the spirit of the day. Side Note: This is how I picture Tiny Tim in my head. Excluding Die Hard, the BEST Christmas movie is The Muppet Christmas Carol. We still managed to prep a bunch of parts and assemblies. Still got a few things built up, even if we just did test assemblies. AND, of course… we still managed to find a bunch of mistakes I made which will need to be fixed before the robot progresses any further “for real”. Oops. It seems like build season weekends are when most of the “big work” gets done. 2019 Update 3 mentioned that we were hoping to get “high-fidelity” prototypes in time for the meeting on Saturday at the end of Week 3. Did this happen? Yes it did! Ball Scoring Test - Successful! We were able to test all our object scoring methods with a “real” version of each of the mechanisms. We’re pretty happy with the results. The design team has begun working on the next version which will integrate in the final robot. Hatch Scoring Test - Successful! Like in 2018, our lift subsystem is one of the last ones to have its design completed. The folks working on this mechanism had a lot of detail work to “get right” and also needed to integrate with most of the other subsystems. The result? The design work is just finishing up, and we’re releasing parts for manufacturing. (Including some parts which were redesigned to alleviate the 3D printer bottleneck). I love our end-game. I love the plan. I love the mechanism. I love the strategy behind it. If it works, I am going to giggle every time we do it. I don’t even care that the first prototype was kind of a disaster. We LEARNED a lot from it. This will totally work. I believe. The next version of the design is coming right along. As I said above, while we have sheet-metal Christmas, we’re only on Day 4 of 3D-Printer Hanukkah. We have a few more “crazy nights” before we get all those parts delivered and can finish construction. Maybe we’ll have one of the drivetrains running early this week! The electronics panel designs are about 80% completed, and the electrical team has begun wiring up some of our boards. I love when the robot has a modular control board, since it makes a huge chunk of the wiring a “parallel process” instead of a “serial process”. Programming - Auton Test Success! The programming team has been hard at work playing with one of 2018’s practice robots. (Not the one we threw into the garbage, the one used for code testing during the season.) This weekend it successfully jumped off the level 2 platform, and did some autonomous scoring. Color me impressed! I love it when the robots do amazing things autonomously! 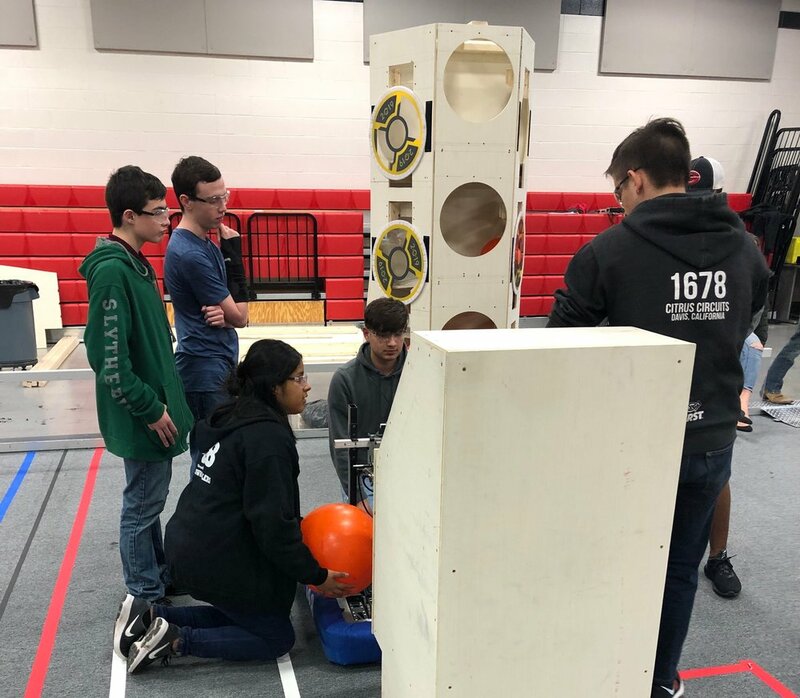 The Robowranglers and Greenville ISD were fortunate enough to have the 2018 Battlebots Champion - Bite Force on display this past weekend! Our three retired champions swapping stories with a @battlebots legend! While we're honored that some people idolize our team to the point they'd order a counterfeit T-Shirt, why would you order a counterfeit T-Shirt? I am a giant Grinch. Many people (other than me) DO in-fact enjoy teasers. Some of those people would enjoy some teasers of the Robowrangler 2019 robot. In the spirit of “give the people what they want” and more importantly “do what ‘The Boss’ tells me to do” I’d like to share a few CAD teasers of the 2019 robot. Even I don't fully understand. $1 says this gets cut-off the robot. It’s amazing how you can show so much, and yet still show so little! People seem to be confused by my references to “The Boss” of 148. Some people think D-Row is the boss (including him). Some people think I’m referring to myself in some sort of weird 3rd person. There is only one boss on 148, and it’s Adrienne Emerson our lead teacher. After we posted our first “full integration” screenshots to Slack, everyone was admiring the robot and commenting on the design. Jessi was the one to sober us up: “Not to stomp all over this parade, but I’ve gotta say it: the lift mechanism is definitely mounted backwards." That someone, for the record, was me. In my defense it looked really good facing the other direction. I guess when you think about it… isn’t that everyone’s plan?